To be added to the Dublin High School Athletics email distribution list contact dhsathleticboosters@dhsathleticboosters.com. Prior Dublin High Athletic Boosters updates are available here. In my last sports update I failed to mention that Freshman Jabari Jefferson was also selected to the All Tournament team for the Benecia Frosh Tournament. Congratulations to him! Did you know that DHS has 3 Lady Gaels competing in wrestling and all three have earned medals? Congratulations to Rachael Chinn who took 2nd place at the Castro Valley tournament. This was followed by a 1st place win at the Liberty tournament. She took 1st place with a 1st round pin. Linda Tran took 5th place at Castro Valley tournament and 3rd place at Liberty Tournament while Juliet Roufchaie took 5th place at Liberty tournament. Way to go Lady Gaels! Congratulations are also in order for Zach Little who took 1st place at the Castro Valley tournament at 160 pounds, Major Stelly who took 3rd place at the Liberty Tournament at 139 pounds and Nick Sinai who took 5th place at the Liberty Tournament at 145 pounds. The DHS Cheer program is having a fundraiser at Vito’s Express. 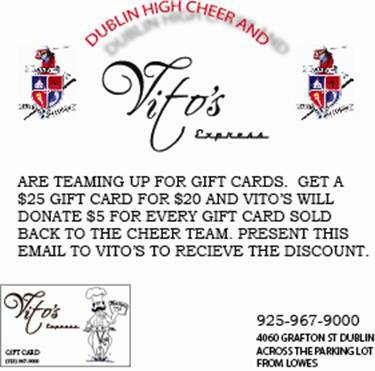 Buy a $25 gift card for $20 and Vito’s Express will donate $5 to the cheer program. Please see the flier at the bottom of this page. The Men’s and Women’s Varsity Basketball teams will be playing our big rivals, Dougherty Valley tomorrow night (Tuesday) at 5:30p.m. and 7p.m. respectively. Please come out and support our teams and let’s show Dougherty Valley what GAEL FORCE looks like!! Remember there is a big trophy at stake when the points are accumulated for the winner of all varsity sports vs. Dougherty Valley. The next Athletic Booster meeting is on Monday, January 9th at 7p.m. in the Career Center. Please join us. For Spring Sport Athletes- There will be a mandatory Parent Meeting for Spring Sports sometime in early February. I will let you know the details of the meeting as soon as they become available. Spring sports include: Baseball, Softball, Track, Swimming, Men’s and Women’s Lacrosse, Men’s Tennis, and Men’s Golf. Please remember that Spring Athletes need to turn in the athletic packet including the physical form signed off by a physician. If your child doesn’t have a physician, there will be a Sports Physical night sometime in early February. I will send out the details as they become available. Now that we all have our 2012 calendar’s up, please mark Friday, May 4th, 2012 as the date for the Athletic Boosters Golf Tournament and Dinner. More details to come! As always, please consider volunteering for one of our snackbars. All monies earned from our snackbars benefit ALL SPORTS at DHS.